On February 1, TI celebrated a momentous occasion and honored TI’s E2E™ contributor Jens-Michael Gross during the 2013 E2E (engineer to engineer) Community Awards Ceremony in Dallas. Gross is quite the celebrity on TI’s E2E community. The E2E community exists to support users via various forums in which customers can search for answers, post questions, and receive replies from TI-ers and other customers. In his spare time, Gross has written over 10,000 posts on E2E forums to help other engineers achieve success with TI products. 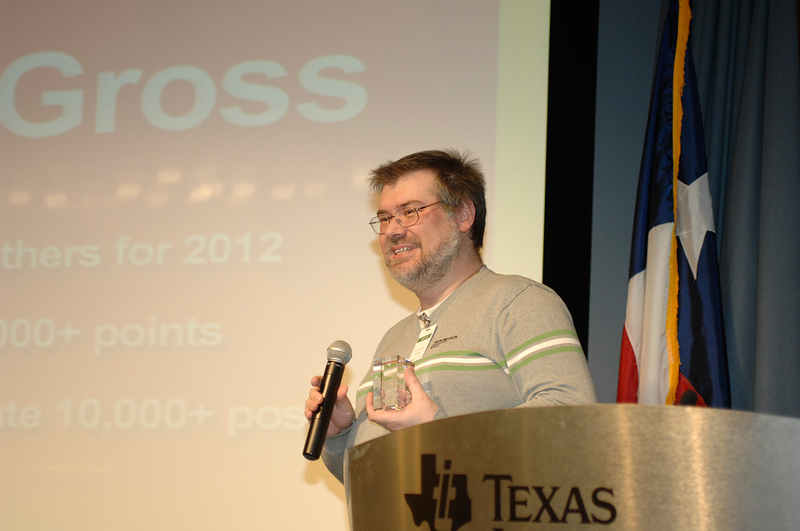 While the TI E2E Community is broad and diverse, Gross was the first member to achieve Guru Status on E2E, has won the E2E Contributor of the Year award for three years in a row and has racked up over 123,000+ points. He’s done all of this on his own time and as a non-TIer, simply to help out other E2E community members and fellow engineers. 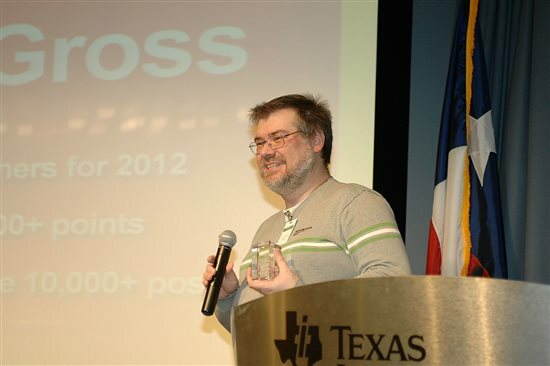 At the ceremony, Gross was asked why he answered so many questions on the forum, and he answered that he was an addict and loved solving riddles. Gross flew from Berlin to attend the ceremony as well as meet with the MSP430™ apps team. “Jens-Michael Gross is one cool dude!” said Dung Dang, an applications engineer for MSP430. We agree – Congratulations, Jens-Michael! Waiting for Jens-Michael Gross to publish his book. It would be great to know the tentative date of release of his book and the name of the publisher so we can keep an eye on it.